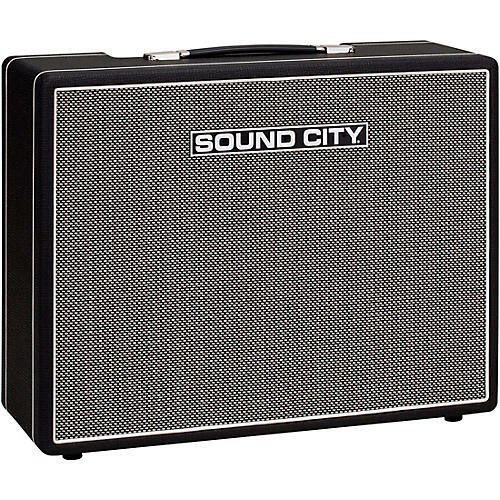 The Sound City SC30 Combo is evolved from the original Dave Reeves designed Sound City One Hundred from which the new Sound City Master One Hundred and Master Lead 50 amplifiers were created. Hewing closely to the bold sonic foundation of its bigger brothers, the SC30 delivers unusual clarity, punch and sweetness for its size and power. Linking the expressive Gold Lion KT66 “Kinkless Tetrodes” to the classic Reeves inspired phase inverter design in a cathode biased configuration yields a remarkably rich harmonic balance and tonal detail from single coils and humbuckers alike. Driving those big bottles, the 12AT7 based Differential Pair phase inverter produces ample voltage for a smooth and effortless transition into thick power amp saturation. The 5AR4 tube rectified power supply insures responsive power supply recovery with a natural and understated compression that yields expressive chime and sustain without excessive sag. To top it off, Sound City utilizes a genuine Partridge inspired paper insulated output transformer to deliver the sonic payload to a specially created and carefully evolved rendition of the original Sound City Power Speaker, right down to the original label design. Whether you are a pedal aficionado or a “straight-in” player, you’ll find the SC30 ready, willing and able to deliver inspired and effortless tonal expression. Tubes: V1 - 12AX7 Tung-Sol; V2, V3 - 12AX7A Ruby Selected; V4, V5 – 12AT7 Ruby Selected (preamp); Gold Lion KT66 Matched Pair, cathode biased (power amp). Also accepts 6L6, 5881, etc.